I'm just shocked I haven't posted these pictures. I did...kinda...on Instagram...and it went onto my Facebook page. But it never got here. And for that I'm sorry. Thankfully cookie photos don't go bad. And neither do cookies if you freeze them, but who keeps them around long enough to do that? 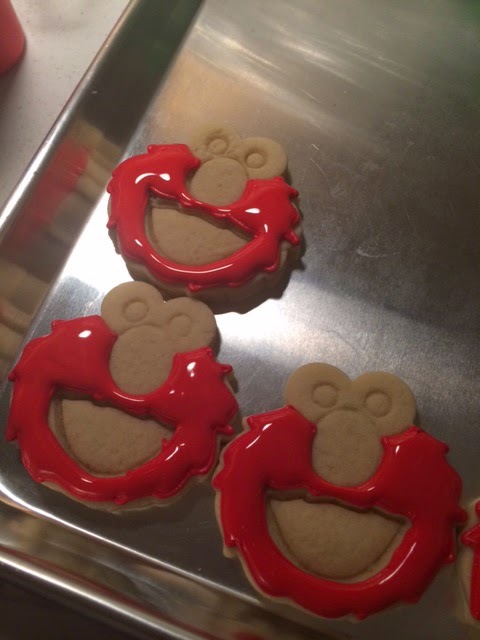 I was asked by a friend to make cookies for her son's third birthday. Who, from what I understand, was having a pirate birthday party. Nothing. Except in cookie form. The birthday boy's mother asked for just a few cookie designs...but because I grew up with her...and because this was such a fun request I went a little overboard. How can you not when it's such an awesome theme? So without any further adieu I bring you...Finn's Pirate Birthday cookies! Arrrrrggggg swashbucklers - we hope Finn had a fantastic birthday. Even if it was back in June. Talk about one of the best ideas for a 1st birthday party. Not to mention one for a little boy who has seen more of the world than some people will see in their entire life! Wyatt's mom asked if I'd be willing to make birthday cookies for her son's birthday when they were still living in Bahrain. Yes, Bahrain. And no that's not in Illinois. Thankfully they were going to be home in the United States, Nebraska specifically, to celebrate his first birthday. His mom came up with the awesome idea of "Oh the Places You'll Go" from Dr. Seuss paired with a travel theme to really commemorate her little guys first birthday. She sent me over some ideas and a picture of the birthday invitation and away I went. I started by using my tierd cake cookie cutter with the idea of turning it into stacked suitcases. And I finally got to use my cloud cutter from Truly Mad Plastics! Not to mention being able to use my Tru Color "sky blue" airbrush color. It was all around a first time for everything! I was pretty happy with how the stacked suitcases ended up. Darn cute. The details will make then even better. I added the words onto the clouds which made them even happier little clouds. Bob Ross would smile. See...I told you the details made them better. Overall, this was an awesomely fun set to make. And I'm hoping the birthday boy and all his party guests enjoyed them! Yeah, I'm making car noises. Can't you tell? They go perfectly with the baby shower racing cookies I made. Did you know race cars are hard? Well, they are. At least I think so. I resorted to drawing on them before I started frosting. And after some dry time wheels were next. The end result was pretty good. I look at this and see 100 things I'd do differently but then again I'm never satisfied. That's what you get when you ask a three and five year old to pick a theme for their brother's 1st birthday party. They thought it was a pretty good idea. I love Sesame Street. I'm a product of PBS and love that darn show. 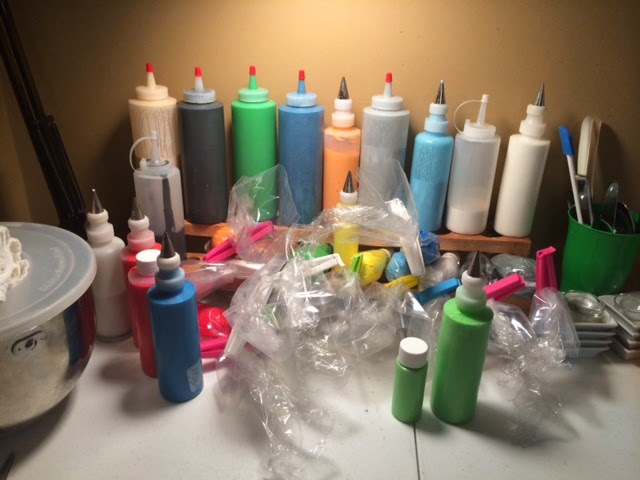 I reminded myself how much I loved the show when I was mixing up every color known to man to make the cookies. However, after my self-diagnosed carpal tunnel stopped hurting, I started to find my love again for my friends at Sesame Street. It also helped that the cutters I use have this nifty little press that gives me a fantastic frosting guide. It's like paint by numbers but for frosting. Just outline and fill. It's like magic. But the end result is pretty darn nifty. Even Ernie is happy. 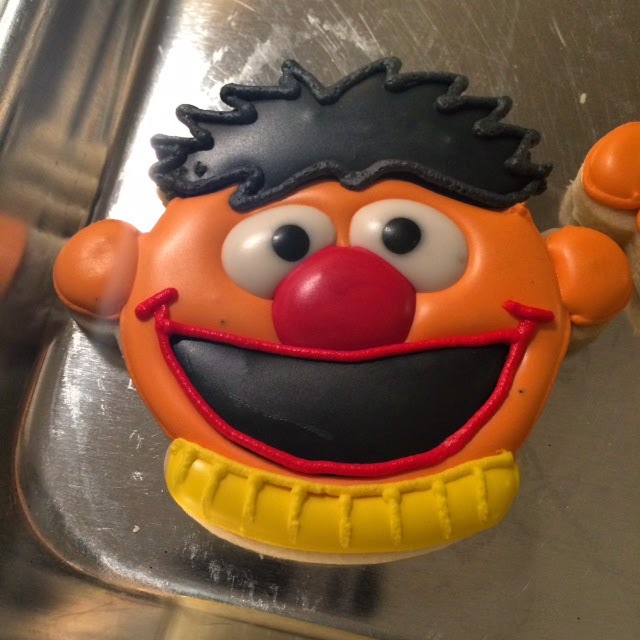 And he doesn't know that I didn't make a Bert. Sunny day, keepin' the clouds away, on my way to where the air is sweet, can you tell me how to get, how to get to Sesame Street? Happy (late) Birthday J.R.! I know you had a great day. Oh, and I still have your birthday present. Yes, you may be two before I get it to you. Waaaaaaaaaaaay back in May. Yes, I did say May. I'm a little behind on posting. Did you notice? 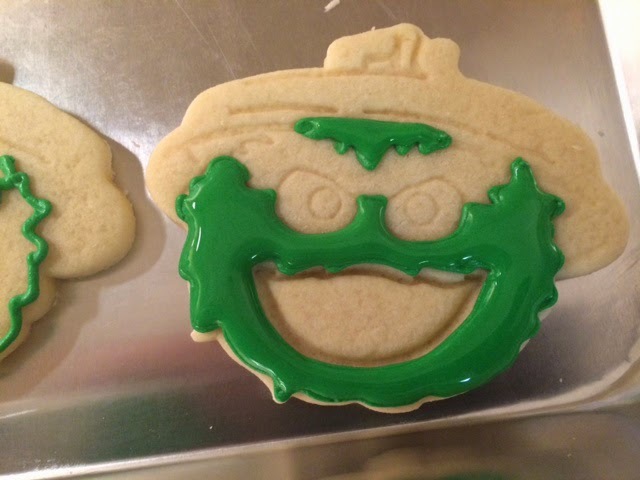 So, back in May I was contacted about making cookies for a birthday...specifically a birthday for this ladies son and husband. One who was turning 25 and the other was turning 70. You can figure out which age goes with which person. They were planning on celebrating the dual birthdays by going to a Cleveland vs. Red Sox game on June 14th. 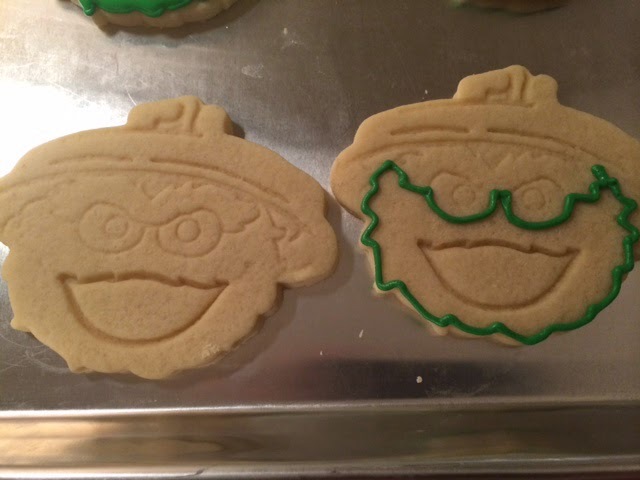 So they wanted birthday baseball cookies. Yes. Birthday and Baseball. Meld it together and what do you get? I thought it was a pretty good combination...and apparently they did too. I got a great email after they had shipped to Cambridge, Massachusetts (and I prayed a lot for safe delivery) that the family and most importantly the birthday boys loved them.